Prime Minister Narendra Modi also said that former president Dr APJ Abdul Kalam would have been happy about the recent success of Mission Shakti, the A-SAT missile test guided by "Sabka Saath Sabka Vikas." 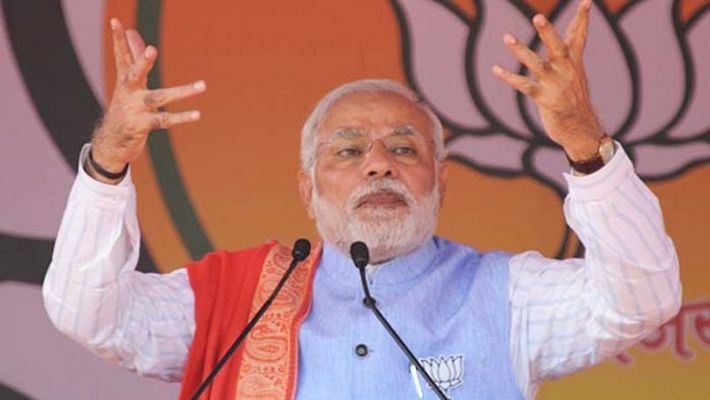 Ramanathapuram: Prime Minister Narendra Modi on Saturday (April 13) assured that if voted to power, his government would ensure the establishment of a separate Jal Shakti Ministry to cater to the many needs of people related to water. Addressing a public gathering at Ramanathapuram, the Prime Minister said, "After May 23, when the Modi government will once again assume office, there will be a separate ministry for Jal Shakti. This ministry will cater to the requirements to resolve issues related to water." "The NDA govt had devoted a lot of attention to water resources. There will be a separate ministry for Jal Shakti to ensure clean water and top class irrigation water facilities is made available for farmers," he added. Talking about the Centre's efforts to develop connectivity and the tourism sector in Tamil Nadu, the Prime Minister said, "Work is fast progressing on doubling of railway tracks between Rameshwaram and Dhanushkodi. The 100-year-old Pamban Bridge has been transformed into a state-of-the-art bridge." Prime Minister Modi went on to say that when the Congress was in power, it remained "helpless and silent" while bomb blasts took place in one state after another. "Those who cannot protect India can never develop the nation. When the Congress and their allies were in power, terrorists were attacking the nation regularly. City after city, there were blasts. But, the Congress remained helpless and silent," he said. Claiming that the Dravida Munnetra Kazhagam (DMK) and Muslim leagues do not believe in the dignity of women, the Prime Minister said, "We brought a bill in the Parliament to abolish the practice of Triple Talaq but Congress, DMK and Muslim League opposed it." Prime Minister Modi also said the Congress, Communist and Muslim League are playing a "dangerous game" regarding the Sabarimala temple row. "They are using brute force to strike at the root of faith and express. Sadly for them, till BJP is there no one will be able to destroy our faith and culture," PM Modi said. Stressing that several fishermen have been brought back from Sri Lanka under his government's rule, Prime Minister Modi said, "Our hardworking fishermen depend on the seas for their income. Your Chowkidar has been able to take path-breaking decisions for the welfare of fishermen. Almost 1900 Indian fishermen have been released from Sri Lanka. Some of them who came back were facing a death sentence."